Almost bereft of stem leaves, a glaucous stem bears seed pods angled upwards, with white flowers atop. Stem leaveswithout stalks and which do not clasp the stem. Flowers with four white petals with rounded ends. Seed pods green at first, turning brown, cylindrical and longer than their stalks. Flowers small, between 2mm and 4mm across. Petals splayed out. Nominally four stamens bearing cream-coloured pollen. sepals browning slightly at tapering tip. Stem leaves fairly thick with a few bristles, actually trichomes. The basal leaves of several specimens. Stems sparsely adorned with hair, as are the basal leaves, which can vary in shape. Some coarsely toothed. The trichome hairs are 1-compound, having between 0 to 4 'barbs' (often called stellate), which are soft and un-penetrating. The gland is seen most easily on the simple-haired trichome top left. All glands are non-secreting. [It might here be assumed that the word 'trichome' refers to there being 'three' of something, but it is from the Greek τρίχωμα – (trikhōma) meaning 'growth of hair']. Some similarities to : Shepherd's-Purse, but that has heart-shaped seed pods. Thale Cress has for the last two decades been used as the plant of preference on which to perform genetic experiments. This is because it has so few genes yet still functions as a plant, making it very amenable for studying the function of these genes. 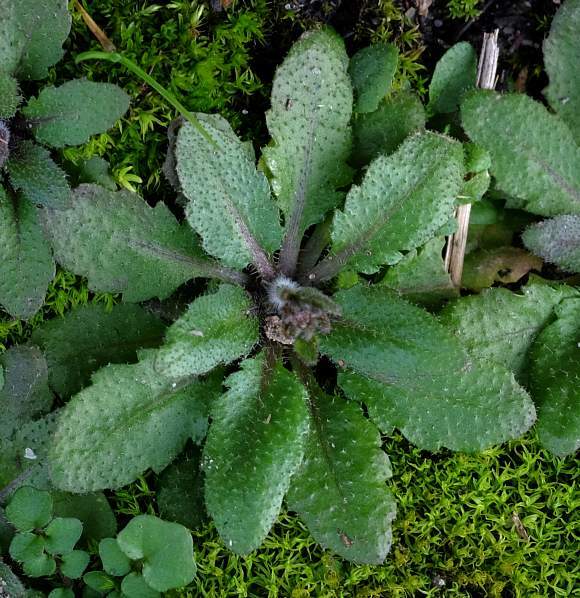 More is now known about this plant than any other. 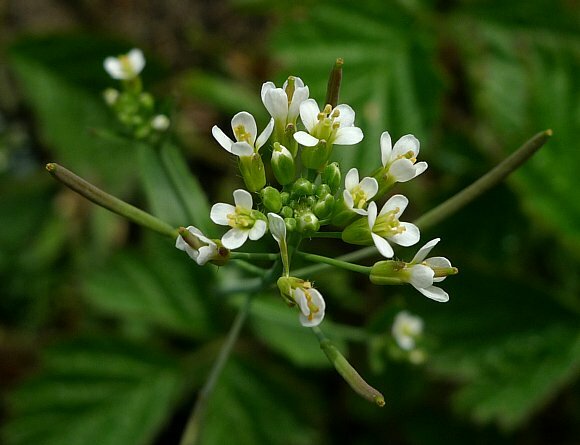 but that knowledge is probably transferrable; the way that the flowers of Thale Cress grow is probably similar to the way other plants' flowers grow. 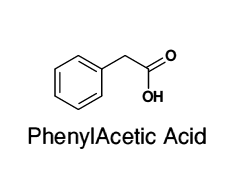 PhenylAcetic Acid (PAA) is a non-indole Auxin which possesses hormonal effects in plants similar to those induced by Indole-3-Acetic Acid (IAA) but is several times less potent. 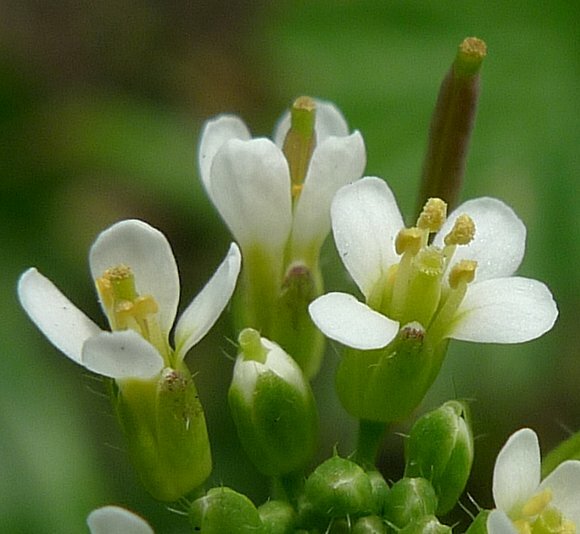 It was once thought not to be found in plants but it has been found in the most-studied of plants, Thale Cress (Arabidopsis thaliana) and has since been found in Tobacco - at several times the concentration that the more potent and better known auxin Indole-3-Acetic Acid (IAA). It is now known to be widely distributed in both vascular and non-vascular plants (those with and without vessels for transporting fluids). Synthetically-derived PAA has been used since 1975 as a phytohormone. 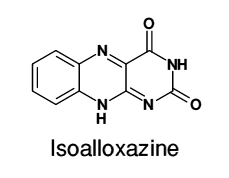 Flavins are a group of organic alkaloids based upon IsoAlloxazine (a tricyclic alkaloid with a Pteridine core) the most well known of which is Riboflavin, a Flavin with a Ribose sugar (more correctly a 'ribityl') moiety attached to the 'R' position. 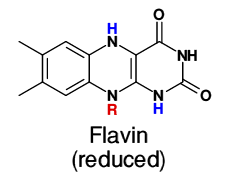 The Flavins are derived from Riboflavin. 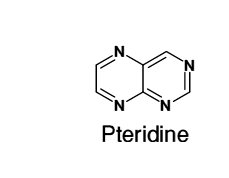 [Pteridine itself is composed of two fused rings, one of Pyrimidine the other of Pyrazine , which are isomers of one another. Compare Pteridine with the Purines, which are bicyclic with 4 similar heterocyclic nitrogen atoms but where one of the rings is 5-sided]. The class of compounds called Pterins are also based upon Pyrazine rings and are very colourful compounds utilised by Butterflies as Butterfly Wing Dyes]. (→UV→) Riboflavin , which is also known as Vitamin B2, is essential to mammals and plays a key role in energy metabolism of fats, ketones, carbohydrates and proteins. 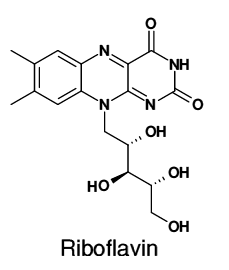 Riboflavin is based upon Pteridine and is one of the Flavins. In solution is both coloured yellow and fluoresces yellow-green under ultraviolet light. In solid form it is more orange in colour. Riboflavin occurs in the free form within the retina of the eye. It is also found in Legumes,Asparagus, Green Peas, Brocolli , Spinach and in whole grains. 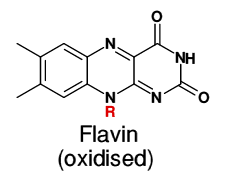 Flavins are those substances with the structures shown above, where the radical 'R' (shown in red) can be any group. Two forms exist, an oxidized form which is yellow in aqueous solution, and a reduced form with hydrogen atoms on either or both nitrogen atoms. If both nitrogen atoms have a hydrogen atom (as shown) then the Flavin is fully reduced and is now colourless. If only partially reduced with a hydrogen atom on either nitrogen atom, then it may be either red or blue, depending upon certain other factors. CRYPTOCHROME 1 An important role of Flavins within living things is that they chemically combine with proteins, the result called Flavoproteins . One such Flavoprotein is Cryptochrome 1 which is a Cryptochrome. Cryptochromes are a class of blue-light sensitive flavoproteins found in both plants and animals which play an important role in the regulation of circadian rhythms and in photomorphogenesis in Thale Cress. 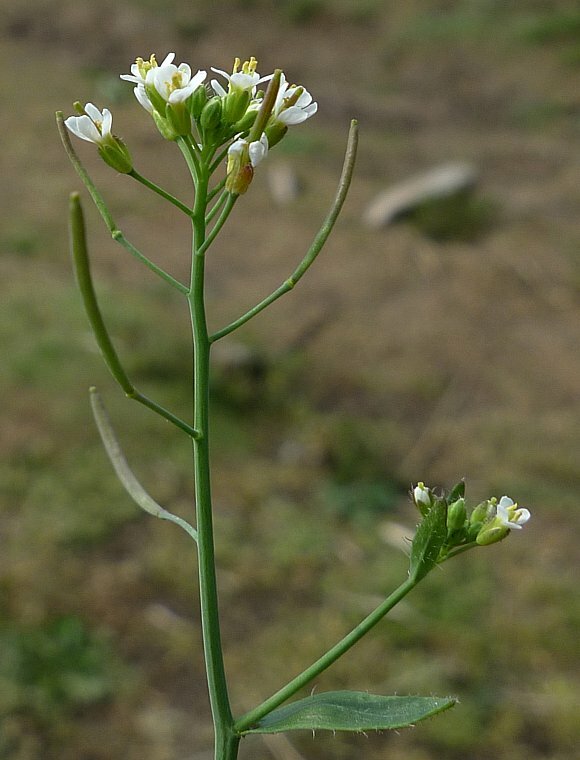 The cryptochrome within Thale Cress is also responsible for its phototropism (the flowers turning towards the sun), for its circadian rhythms and somewhat amazingly is also responsive to magnetic fields. Cryptochromes change colour in response to either acidic conditions or by excitation with light (which frees an electron) where they undergo a change in oxidation similar to that observed in the Flavins. It is not possible to show the structure of Cryptochrome 1, for it has a very high molecular weight, consisting of about 500 amino acids and a flavin adenine dinucleotide. 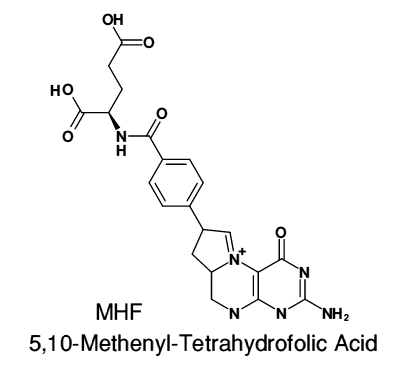 Cryptochrome 1 is known to have two chromophores; a Flavin and a Pterin in the specific form of 5,10-Methenyl-TetraHydroFolic Acid (or MHF for short). Other Flavoproteins mediate the phototropic response to light, where the plant moves in response to light. Thale Cress, in response to blue light, transports Cryptochrome 1 into the cell nucleus where it instigates a change in turgor pressure and causes stem elongation. It is responsible for the blue-light stimulated growth of the leaves. Of all of the substances depicted above, many of which are shown for comparison only, the only ones with a reported presence in Thale Cress are the Flavins and Cryptochrome 1. 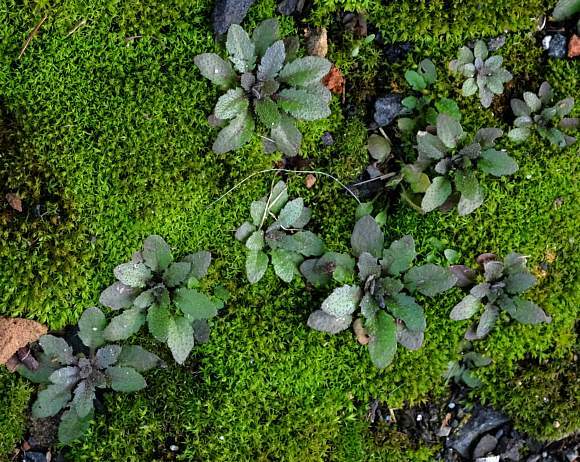 Thale Cress is the most studied plant in history because it is relatively easy to perform experiments with it. Thale Cress has been found to channel light from the sun/sky down through the plant stems and along the roots, as though they were optical fibres. When that light gets to the roots it triggers photoreceptors detectors in the roots (just like it triggers photoreceptors in the stems) which stimulates gravitotropic rot growth, directing roots downwards. Only certain wavelengths of light are propagated along stems and roots and it is these wavelengths to which Phytochrome B responds, in turn activating Elongated Hypocotyl 5 (Hy5 in shorthand), a transcription factor mediating the gravitotropic response. Alas, both Phytochrome B and Hy5 are complex biological molecules which cannot be drawn in this website. It is thought that most plants are sensitive to touch, even if they do not respond by physically moving like Mimosa Tree leaves do when they are touched. 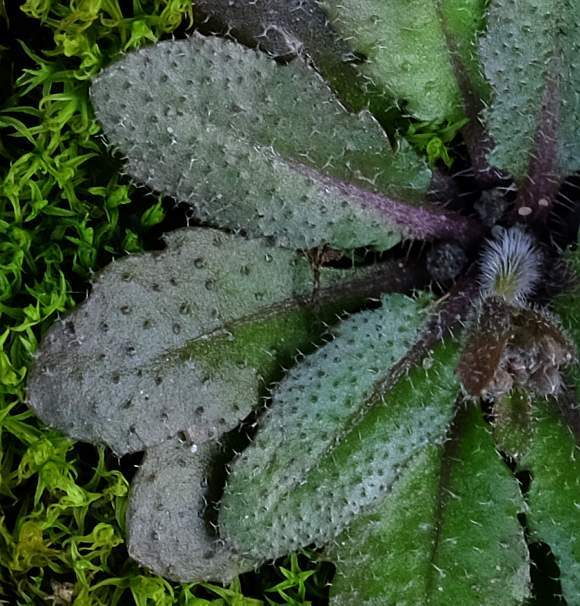 It has been discovered that when touched, most plants respond by changing the plants genome. Within half an hour of being touched (either by a soft paint-brush, or a mammal or insect the plant responds by altering the expression of 10% of its genome. This is an automatic protective response, which uses up some of the resources of the plant, which is then not available for growing. If touched enough times the growth rate can be reduced by up to 30%. But the touch also stimulates the plants immune system. In one study it was found that a touched plant (it doesn't say which species) helped the plant defend itself against attack by a fungus. 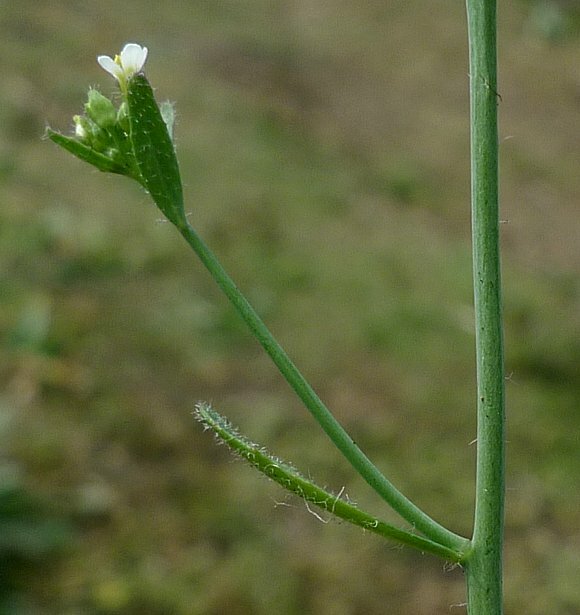 This response to touch by altering the expression of some of its genes is called Thigmorphogenesis and has been observed in Thale Cress. Whereas the response to touch by movement is called Thigmonasty , which will necessarily involve Thigmomorphogenesis too.